Fox McCloud, unrivalled Arwing pilot, takes his first steps on land when he visits Dinosaur Planet. 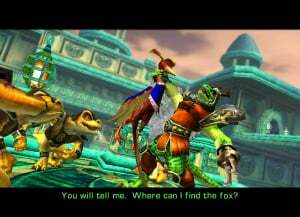 Our hero receives a distress call and — like all good foxes — decides to investigate, discovering the planet's evil ruler, General Scales. The other dinosaurs are all under attack from him as he seeks their power that holds order in the world, so naturally it's your job to save the dinosaurs and a hot female fox that has been somehow been suspended in a crystal. Armed with her staff and a small dinosaur, can you save the day? 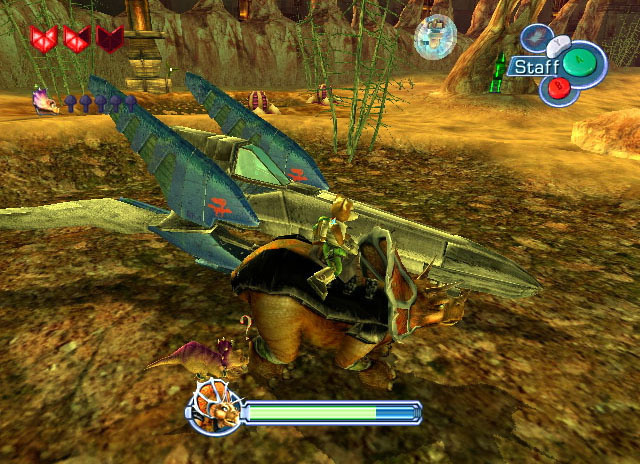 This is the last GameCube game by Rare, fond former partners of Nintendo, now working with Microsoft. Many Rare workers left before this game had gone gold and as a result this is one of their few flawed games. 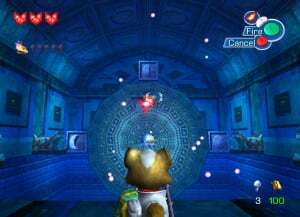 Many people will remember team Star Fox from the N64 game Star Fox 64 (aka Lylat Wars) or the Super NES game Star Fox (or Starwing); in both, Fox flew through space in his Arwing defeating his nemesis Andross. We've had a lot of Arwings and that’s why it was a nice surprise to see that Fox McCloud was having a game where he would be on foot for 90% of the time. 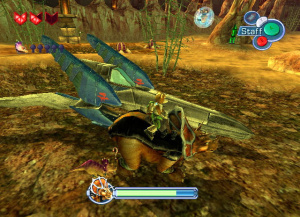 You still get the classic Arwing bits when you travel to levels, but the game's focus is laid out in the title: Star Fox Adventures. For the vast majority of the game you are accompanied by a little dinosaur royal, Prince Tricky. This guy helps you dig up hidden items, burn enemies and a few other vital side-kick actions. You control everything about him except movement and if you want him to use skills you can; just make sure he has been fed. Over the course of the game you will visit different sections of the planet, all of which aer unique and visually pleasing: snow levels, beach levels, temples and many more that will leave you staring for hours. You spend a fair amount of time simply exploring each level, trying to find any hidden goodies, with each stage holding a dinosaur who's been imprisoned by General Scales. The combat system is basic and this lets the game down slightly. To attack with your staff you simply press A in a rhythmic sequence, and while you can also use special staff powers this process is slow. The most enjoyable combat move is where you prompt Tricky to breathe fire upon the enemy, torching them as they run around in flames. There isn’t much in the way of difficulty here, and the average player shouldn’t die much. The length of the game is around the 20 hour region and there isn’t much inspiration to play it again soon after. The game's finale — particularly the final boss — is disappointing though, and those expecting a classic, climactic ending won't find it here. SFA is a good solid adventure with lush visuals that is let down by dull controls. The game promises so much to the player but it just lacks the execution in its gameplay: it should have been so much more, and is a disappointing end to what was once a magical collaboration between Rare and Nintendo. 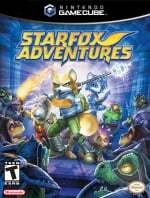 This is nowhere near the quality of Banjo Kazooie, but if you're crazy about adventure games and want to see where Fox goes on foot, this is still worth a try. 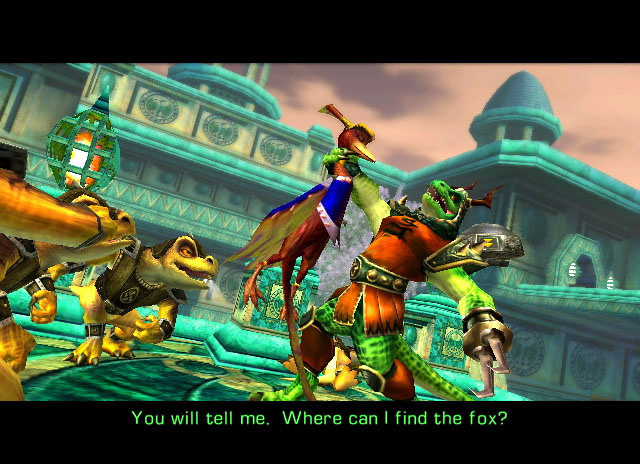 Yeah, I really enjoyed the visual aspects of the game, its certainly up there with the best on the Gamecube. The combat system seemed to get that little bit repetitive, finding yourself using the same technique for every enemy. However, I would certainly recommend this to gamers who want a visually impressive title thats not too challenging on the skill side. I was extremely dissapointed with this game which is a shame as Lylat Wars is my favourite game. Probably to do with the lack of shoot em up Arwing action but even as an adventure game I dound it too dull and to easy in both the puzzle solving and the fighting area. When I bought it back then I was really disappointed because it wasn't what I wanted. Years after I sold it I bought it again used and today I can enjoy it for what it is. I started a new file in this game yesterday. Brings back memories.. the music and graphics are fabulous. i would agree with antdickens though, the fighting does get repetitive, its not varied enough. My favourite Star Fox game is Star Fox Adventures (I haven't played Command and Assault). I know most people don't like it because is an adventure but I love it. There are some space shooting sections and although they are brief they are well done. Really loved Star Fox Adventures when it came out. Felt as futuristic as F-Zero GX for me as a Gamecube-exclusive player. Planning to take it on again soon.